After the Bundesliga finally made its comeback on Friday night, we were treated to a range of matches yesterday with the pick of the bunch being a repeat of the season opener as Dortmund travelled to Mönchengladbach’s Borussia Park. Tuchel’s side were hoping to repeat the scoreline too after they dominated Gladbach in a 4-0 win which signalled the start of the ex-Mainz coach’s spell in Dortmund. Since then, many changes have been made at Gladbach as Favre resigned following a surprisingly-bad start to the Hinrunde and was replaced by André Schubert. The ex-St. Pauli coach had a striking influence on the Foals’ defensive strategy as they became increasingly man-oriented without possession. Under Lucien Favre, Gladbach had an excellent defensive organisation which was the basis of their strong record against Guardiola’s Bayern Munich. He employed a position-oriented defensive strategy where the defenders would organise themselves based on their teammates and their own positions in a defensive block. They don’t look to exert a high level of pressure on the ball and instead control the space within their defensive block paired with a high level of compactness and ultimately stability. If the ball is moved to the open wing, Gladbach would shift with excellent efficiency to close that once-free space, forcing the opposition to recirculate the ball in (often-failed) search of open spaces. However under Schubert, Gladbach have looked to enforce more pressure higher up the pitch. However, without change of the defensive strategy they could not do so due to the nature of position-oriented zonal marking – which is more based around maintaining and controlling space. Because of this, Schubert’s side are now more focused around man-orientations in pressing which then allows them to benefit from an improved defensive access. For extended reading on the different variations of zonal marking, read RM’s tactical theory piece here. These man-orientations were clear to see and played an important role in the matchup against Tuchel’s Dortmund, as it not only provided benefit to Gladbach but also was situationally one of their weaknesses. During the home side’s pressing, they looked to clear man-mark all the way up the pitch. In some cases, the side looked to be organised without a definitive structure as every single player marked a Dortmund player. The scheme was most clearly seen when Dortmund were building possession within their own half. Weigl was tracked quite closely as Gladbach would enforce both Nordtveit and Dahoud on the young pivot and Gonzalo Castro respectively. The coverage of Gündogan was generally shared between Elvedi and, to some extent, Johnson. Through covering Dortmund man-for-man, Schubert’s side were able to close out key players for Dortmund and restrict their influence on the game. This was particularly telling in the build-up phase for the away side as the likes of Gündogan weren’t able to support to their usual extent. Despite such a distinct man-orientation however, Gladbach were able to maintain a fairly stable structure. Although they are not able to exert the same level of spatial control, they managed to restrict Dortmund from exploiting central gaps for long periods of the game. Although their man-oriented pressing was strong for the most part of the game, it ultimately hurt them as a poorly-co-ordinated press lead to Reus’ opener following an excellent through-ball by Gündogan. When pressing the goalkeeper, Gladbach generally looked to go man-for-man across the pitch with the exception being Gündogan. The responsibility of covering the midfielder was shared across the nearby players and in this case, they co-ordinated the press poorly and left him open. Bürki had attempted this long ball on a few occasions beforehand and in the first instance he finds him, Gündogan moves the ball forwards and plays Reus in behind Elvedi for a great finish. With the ball, Gladbach had a clear central focus in attack as they attempted to make quick combinations within the 3 middle columns of the pitch. Both Traoré and Johnson had a tendency to drift inside whilst Stindl and Raffael were effective in both supporting and leading the narrow attacks. The central-focus was on show for their only goal of the game as a narrow attack saw Gladbach move the ball into a dangerous area around the edge of the penalty box. Even though the ball was lost, Gladbach soon regained possession through a counterpress facilitated by their centrally-orientated shape and they could then combine to free up Raffael for a clear shot. Against Gladbach’s pressing, Dortmund periodically struggled throughout the game as their display in possession suffered as a consequence. Their build-up was restricted significantly and Bürki made numerous long balls to the wings whilst key players struggled to be integrated well enough. A surprising feature of Tuchel’s side in possession was somewhat of a wing-focus, particularly throughout the first 30 minutes. With the ball, they often looked to play towards the wings where they would form small structures between 3-4 players who would combine to break through down one of the flanks. Both Castro and Gündogan showed lateral movements as they would support down their respective flanks which saw a lot of the ball through the first half. This came to variable success, as the strategical intelligence of players such as Mkhitaryan and Gündogan supported this tactic at times, the wings were only going to provide a limited amount of success. Yet especially down the right, Dortmund managed to break through a few times with strong movements by Piszczek helped on by the presence of Reus and Gündogan in combinations. They made a couple of threatening cut-backs from inside the penalty area after finding space down the right flank to move into a dangerous position. 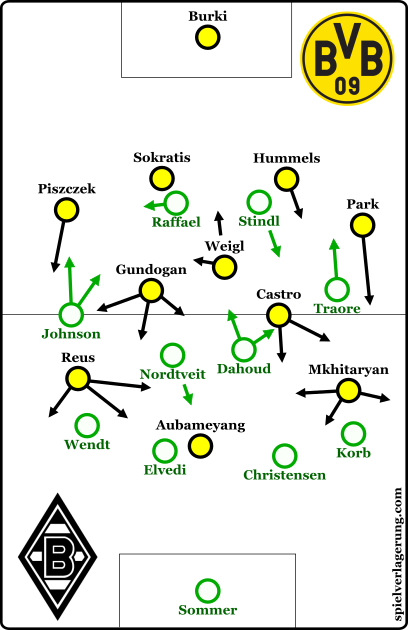 In some cases, the wing-focus opened up space in the centre as Gladbach would follow the wide movements of both Castro and Gündogan and leave the midfield exposed. Despite this, Dortmund still had issues in moving the ball into these areas, with the structures around the wings not often allowing the ball to come back inside after the initial combination. Between the players around the ball, in a number of cases none of them would be positioned around the half-space where they could channel the ball circulation back towards the less-stable centre. As the game progressed however, Dortmund improved and managed to find the ball into more dangerous positions in the centre. In fact, one of the first times they managed to create central access was the moment where Gündogan hit the crossbar from distance after a spectacular vertical pass by Hummels. They increasingly managed to break Gladbach’s man-orientationed organisation by good movement from the midfield whilst they began winning more individual battles too. After Raffael scored to make the score 2-1, Dortmund looked to struggle as Gladbach came back into the match with increased pressure on the away side’s goal. Gladbach threatened particularly in transition through their dangerous combinations down the middle with Raffael and Stindl at the forefront. The game started to become more open as both sides created chances in attack with a Dortmund win far from secured. In reaction to this momentum shift, Tuchel’s side too displayed their potential as a strong counter-attacking team as they became a greater threat in transition. They created a number of dangerous situations in transition with one of them ultimately leading to a goal from Gündogan after Sokratis carried the ball through the right half-space. At 2-1 Tuchel introduced Durm and Ginter for Reus and Castro in an incredibly defensive change. As the latter 45 progressed on, Dortmund steadily regained control and managed to tame Gladbach through an increased stability in their possession game whilst the Gündogan’s goal sealed victory at Borussia Park. Although the performance was far from the level we saw on the first day of the season, Dortmund played well enough to start the Rückrunde with a win against one of the strongest opponents in the league. Despite their troubles in possession, they played well enough overall and eventually managed to overcome Gladbach’s man-oriented defence in an good win for Tuchel’s side. Perhaps because not many understand it. Great work. Keep it coming. Just one thing: Keep on doing that amazing stuff! Do you know why there aren’t that much comments? Isn’t it possible to find more people who care for tactics?